The Parrot AR Drone 2.0 Elite Edition is one of two different UAVs – Unmanned Aerial Vehicles – in the Parrot AR.Drone 2.0 line. 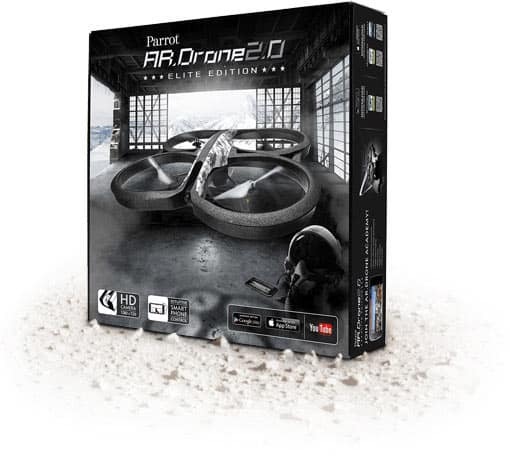 The Parrot AR.Drone 2.0 Elite Edition is a more inexpensive version, while their Parrot AR.Drone 2.0 Power Edition has a longer running time and a few differing features. The Elite Edition is a great choice when you’re just starting out with drones. Most likely you’ve heard of flying drones in the news. The USA military uses flying drones overseas in Iraq and Syria. The police use drones to hunt down criminals at night. 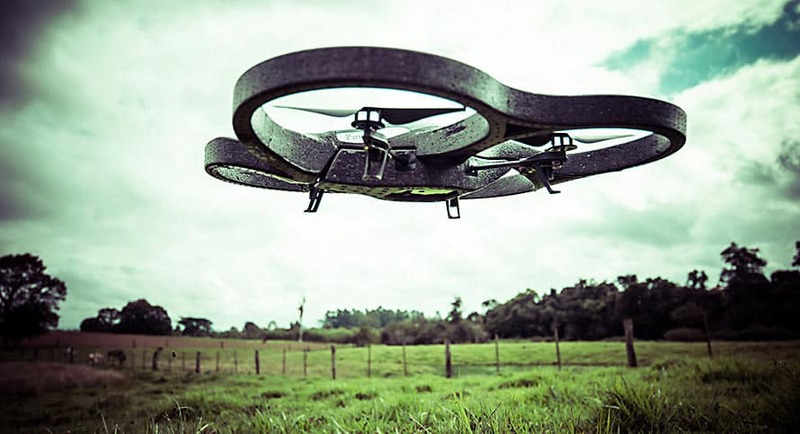 While they may get a bad rap sometimes, drones are used for recreational purposes as well. There’s not a funner toy on the market than getting to play with the Parrot AR.Drone 2.0 Elite Edition. If you complain about your family not getting enough outdoor time, buying them one of these flying drones is sure to get the entire family outdoors for some fresh air. Best of all, you can run them all year long, as long as it’s not raining or snowing. The Parrot AR.Drone 2.0 Elite Edition makes a great gift, whether for birthday or Christmas. The Parrot AR.Drone 2.0 Elite Edition is a quadcopter, meaning that it flies similar to a helicopter, but has four rotating blades. The Parrot AR.Drone 2.0 Elite Edition measures approximately two feet wide. 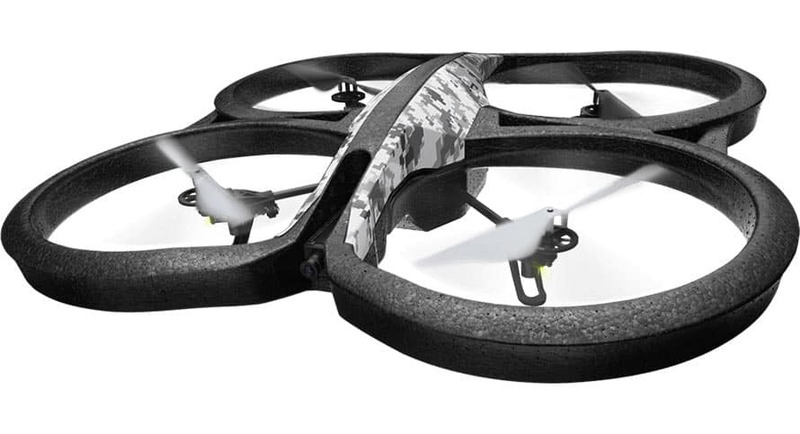 The Parrot AR.Drone 2.0 Elite Edition comes in three different camouflage styles: sand, snow, and jungle. This drone retails for around $300, which is a great starting point, to see if you enjoy the drone hobby, without having to spend $1200 for a more expensive model, when you’re not certain you might enjoy it. Start out with the Parrot AR.Drone 2.0 Elite Edition, and we’re sure that you’ll be on your way to collecting more quadcopters for your collection. In the box you’ll find your flying drone with two cameras, one a higher resolution, the second to take video from below at a lower resolution. It has a 1GHz 32-bit ARM Cortex A8 processor, 1GB of RAM, GPS, and Wi-Fi connectivity. The Parrot AR.Drone 2.0 Elite Edition has built in technology that allows it to fly, including gyroscopes, pressure sensors, accelerometer, and ultrasound sensors. You connect your smart device to the Parrot AR.Drone 2.0 Elite Edition built in WiFi, in order to control it from the ground. There is a rechargeable 1,000mAh battery, taking only 30 minutes to charge up. There are two body shells included. One has foam pads for the blades so that you don’t damage the furniture or harm people, and the outdoor shell has uncovered blades to maximize outdoor flying. If you’re searching for a drone that has a fancy controller, look for a different model, because the Parrot AR.Drone 2.0 Elite Edition doesn’t come with one. This device must be controlled from a portable smart device such as an iPhone, Android, iPad, tablets, and the NVIDIA Shield controller. You’ll first need to download the correct app, named FreeFlight for the Parrot AR.Drone 2.0 Elite Edition. Once you’ve set it up at home, you’re ready to take your Parrot AR.Drone 2.0 Elite Edition out for a flight. The Parrot AR.Drone 2.0 Elite Edition comes with several different settings. To help you get started, it’s best to start with basic settings, until you become a pro at flying. The Parrot AR.Drone 2.0 Elite Edition lets you adjust altitude, rotation speed, and other flight settings, before you even take to the air. Start with the lowest and slowest settings to help you get started. Be sure to allow for plenty of flying room, as your drone is two feet wide. Unless you have plenty of indoor space, it’s best to start outdoors. Start with your backyard, before heading to the park. Be sure to keep valuables out of reach, such as vehicles or patio furniture. The Parrot AR.Drone 2.0 Elite Edition is run with the FreeFlight app and is really simple to use. To get started, you hit the “takeoff” button. There are two screens, which show each of the camera’s viewpoints. There’s also the controller screen, where you control how your Parrot AR.Drone 2.0 Elite Edition flies. There’s a handy recording button, so you can choose to record a video at any time during play. When you’re just starting in the RC hobby, you may be wondering why you should spend so much cash on a drone, when you could just buy a cheap RC Helicopter instead. 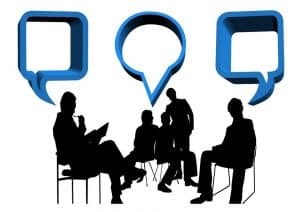 But the truth of the matter is that unless you’re an RC flying pro, you are most likely going to send your RC helicopter into a bad crash, thus wrecking it. The Parrot AR.Drone 2.0 Elite Edition comes with built-in stabilizing technology, that constantly evaluates and adjusts its internal settings. The Parrot AR.Drone 2.0 Elite Edition is the perfect option for the newbie on the block, and even young kids will soon learn how to operate it. The Parrot AR.Drone 2.0 Elite Edition has finely tuned technology, so that everyone can participate in the UAV hobby, without having to worry about smashing their expensive toy on the first run. The Parrot AR.Drone 2.0 Elite Edition is a great drone to buy when you’re just starting out in the hobby. You may find that some features can be a bit limiting, so you may wish to buy an additional battery to increase your flight time, or spend another $70 for the Parrot AR.Drone 2.0 Power Edition instead. Being able to run the Parrot AR.Drone 2.0 Elite Edition with an iPhone or smart device app is a whole lot of fun, and allows you to save the video from the cameras, so you can share them later.